I know that some of you may not be very familiar with World War One, aka The Great War. I know that it may seem obscure and unintelligible, most especially to my American friends who are taught more or less nothing about it in school. The United States played a significant role in the war, but that role was (relatively) brief, and American casualties were (relatively) much smaller than that of other countries. BUT, it is still an utterly fascinating period, when warfare--and medicine--were becoming recognizably modern. Obviously, medicine constantly evolves, but times of war seem to really accelerate the pace, or at least put the changes into focus. I've done quite a bit of research on Civil War medicine, which saw advances particularly in plastic surgery. Still, medicine was still very basic by modern standards. Just fifty years later, however, the field of medicine was almost unrecognizable. Germ theory had revolutionized the way medicine was conceived of at its most basic level. Not only was it finally clear what caused diseases, we could even see the little monsters. And with that knowledge, infections could, with careful attention, be prevented to some degree. Surgery improved by leaps and bounds and the danger of post-surgical infection went down dramatically thanks to simple sanitization. There were new anesthetics and antiseptics, and drugs like cocaine were used to alleviate pain. Blood tranfusions became viable and common (which, by the way, plays a major part in one of my WIPs). Doctors were more professionalized, and scientific research was more regularized. X-rays (even mobile x-ray units) came into use to spot broken bones and other internal problems. Motor ambulances and trains got the wounded to hospitals quicker. But there was still one major problem: while doctors knew what caused disease and had tools to fight the advent of infection, there was nothing much they could do once an infection set in: there were no antibiotics. It was a paradox. They knew what was wrong but couldn't fix it. It wouldn't be until penicillin was discovered in the '40's that we would have effective antibiotics. For being so small, it packs a punch. The website provides beautiful images, and you can zoom in close for magnificent details. I went to the National Museum of American History to see it myself, but you get a great view from your living room computer, too. The exhibit talks about how enlistees were measured for physical and mental fitness before they could join the ranks, about women in the war and professional training for medical personnel, and about the care of wounds and the wounded. I was interested in the role of women in the war, since one of my characters is a VAD nurse. The Smithsonian happened to also have several ladies' uniforms on display as part of a different exhibit. No VAD uniforms; VADs were British, and the exhibit was about the American experience of the war. These uniforms were from various organizations, such as the Army Signal Corps. Here's a link to that exhibit. The x-ray machine looks like something from Jules Verne, and the medical chests and belts really bring home the reality of what the medical officers were facing. 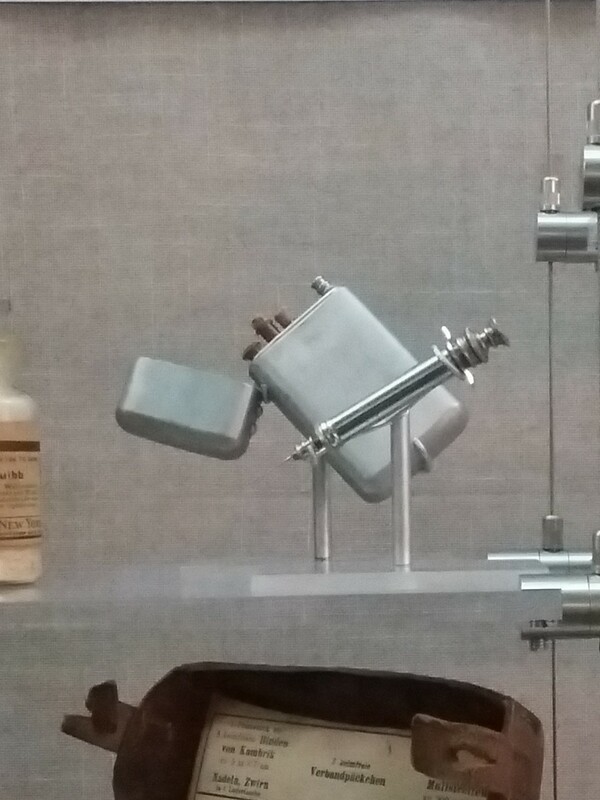 It can be hard, staring through a glass case, to put the objects in context and really understand how they were used and the stories they tell. My favorite part, though, and the reason I made the trip to the museum, was to see the hypodermic needles. Yes, hypodermic needles. They were in use by the time of the Civil War, but they weren't all that widely used. By the time of the Great War, they were ubiquitous. 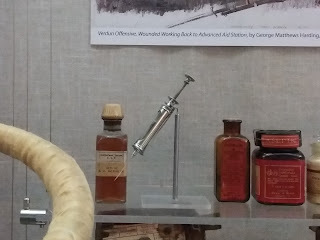 The reason I particularly wanted to see a WW1 syringe was that a syringe plays a major part in that same WIP that involves a VAD. It's filled with cocaine because the male main character has a bit of a habit. I realize that's somewhat cliche, but the context is very unusual, and so is the use of the syringe. But it any case, I geeked out just a little bit and took some pictures. This was a fun side-trip for me, and it was a reminder that no matter how many times you may have been to a museum, there's always more to see, especially when it's a museum like the American History Museum here in DC. Hypodermic needle, shown here without the case it comes with. Click here to see the Smithsonian item details. Per the Smithsonian website: Hypodermic syringe kit: US Medical Department around 1918: U.S. medical officers carried hypodermic syringe kits on their belts with potent drugs such as morphine, strychnine, and cocaine to combat pain and shock.